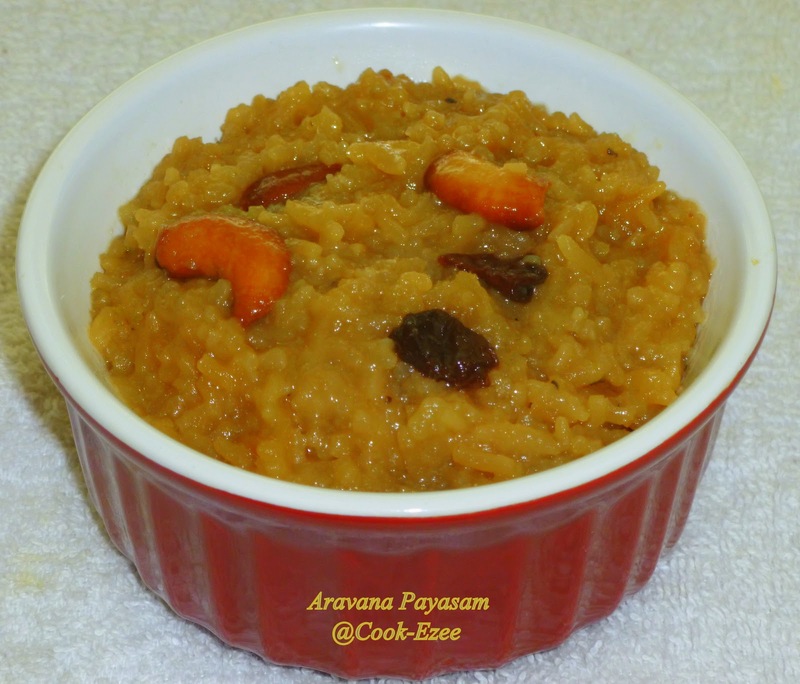 Aravana Payasam reminds me of the prasadam that we get from Sabarimala and Guruvayoor temple. Anyone or everyone who visits Sabarimala or Guruvayoor gets this for their family and for the friends and neighbors. This tastes so good with the richness of dark brown jaggery, ghee and rice - I really don't have any words to describe the taste. But the saddest part was since it is a 'prasadam' from the temple we just get to taste it, may be a spoon or two because it has to be distributed between the family, friends and neighbours. Add 1/2 cup water to the jaggery and bring it to boil. Strain this jaggery syrup to remove impurities if any. Set aside. Wash the rain two-three times and drain the water fully. Set aside. Add water to the rice and get it to boil, stir till the bottom of the pan and let it cook in medium heat. Add the melted jagery to the rice-ghee mix and cook for somemore time, keep stiring in between so that it does not stick to the bottom of the pan. Add a tbsp of ghee to another pan, roast cashews, raisins and broken coconut slices and add to the payasam along wiith the ghee. Add in the remaining ghee if any and mix well. Payasam is ready to Serve. Enjoy!!!!! I have added 2:1 ratio for rice and ghee, you can increase or decrease the quantity of ghee according to your taste or preference. Adding more ghee defintely adds more taste but on a healthier note you can reduce the quantity of ghee to a few tbsp if you are not making it for any special occasion. I would suggest this payasam for kids from age 1-5 when they get fuzzy to eat rice/roti or normal food. Try this for them, they will get a break from the same kind of food. Ghee, jaggery and rice is good for their health as well. You can decrease the quantity of jaggery and ghee if needed. Sort of like sakkarai pongal, very delicious..